Only five weeks after the Dow Jones Industrial Average surpassed the 20,000-point level for the first time in its history, the index has this week reached another milestone breaking through the 21,000 mark. US equity markets continue to rally buoyed by heightened speculation that the Federal Reserve (Fed) will raise interest rates again at its next two-day policy meeting on March 14-15. The Fed last raised interest rates by 0.25% to 0.75% in December. Economists and analysts currently put the likelihood of a hike in March at 88%. The potential for higher interest rates this month has given investors new confidence in the strength of the US economy. Consumer confidence measured by the Conference Board Consumer Confidence Index is currently sitting at a 15-year high, with strengthening labour market conditions and declining gasoline prices being key influences. The financial sector was particularly buoyant as US equities surged higher and Banks, which historically have been able to benefit from higher lending margins during periods of rising interest rates, led the way. 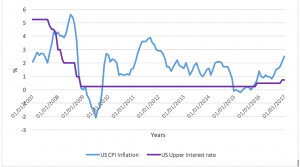 Why are US interest rates rising? Interest rates have been at artificially depressed levels in order to help stimulate the US economy post-financial crisis 2007/09. Interest rates at very low levels can distort markets over a long period and create the potential for asset price bubbles in shares, property and other investments. Therefore, moving back to normality should be seen as positive. Further, as inflationary pressures are expected to build, supported by robust US economic data, raising interest rates is a way of controlling inflation which erodes income. 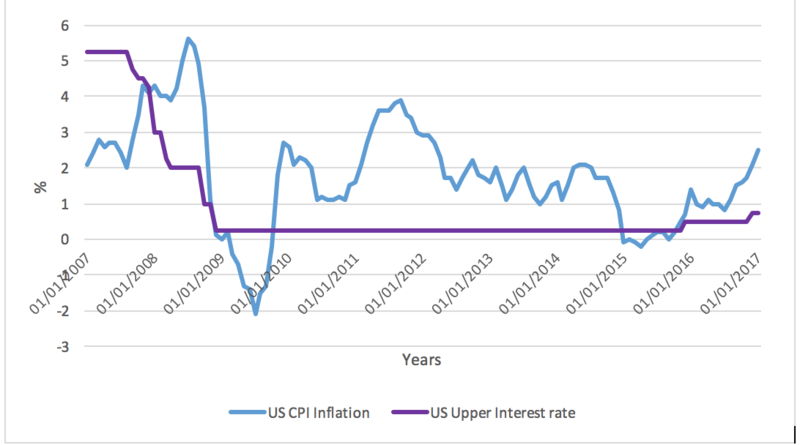 The chart below illustrates how US inflation has been on an upward trajectory since 2015, with interest rates moving higher in response. This week Markit released the Purchasing Managers’ Index (PMI) for countries across the world. The UK Index for construction barely increased while manufacturing dropped by 2.3% to 54.6. Although this fall was bigger than expected, a figure above 50 still represents expectations of growth. Even though the UK’s manufacturing sector is still growing, it has enjoyed mixed fortunes since the Brexit referendum in June. A weaker sterling has made goods from the UK cheaper and so more in demand from overseas buyers (positive for manufacturers). However, raw material prices have risen, making it costlier to produce goods (negative for manufacturers). Nevertheless, employment and the pick-up in export figures suggest that the manufacturing sector is expected to expand and this echoes the survey in which almost half of the companies surveyed expected output to be higher in one year’s time, with only 6% expecting a decline. In a similar vein, the Services PMI has dropped to 53.3 from 54.5 mainly as a result of a weak sterling putting up input costs. According to Markit’s Chief Economist Chris Williamson, “household budgets may be starting to crack under the strain of higher prices and weak wage growth”. The Eurozone manufacturing PMI continued to climb for the sixth consecutive month and reached 55.4. It seems that political uncertainty has not had a significant impact with that part of the economy continuing to gain momentum. “Euro-area manufacturers are reporting the strongest production and order-book growth for almost six years, in what’s looking like an increasingly robust upturn”, according to Markit.